Made In Muscatine – Discover how unforgettable experiences are #MadeInMuscatine! The official blog of the Muscatine Convention and Visitors Bureau in Muscatine, Iowa. Discover how unforgettable experiences are #MadeInMuscatine! The official blog of the Muscatine Convention and Visitors Bureau in Muscatine, Iowa. 11 Ways to Celebrate Halloween (and Dia de los Muertos) in Muscatine! Halloween — and Dia de los Muertos — are big deals in Muscatine! We love celebrating these holidays and want to invite you to celebrate them with us this year, so we’ve compiled a list of ways you can do that throughout the month of October. If you’re plan on coming to one (or more!) … More 11 Ways to Celebrate Halloween (and Dia de los Muertos) in Muscatine! Leave a comment 11 Ways to Celebrate Halloween (and Dia de los Muertos) in Muscatine! Video from Muscatine Second Saturday! The inaugural Muscatine Second Saturday event last weekend was a GREAT success! Thanks to everyone who came down to enjoy the evening of music, art and entertainment with us in downtown Muscatine! Muscatine Second Saturday is a monthly arts and music street fest held on Second Street in downtown Muscatine from 5-8 p.m. on the … More Video from Muscatine Second Saturday! 1 Comment Video from Muscatine Second Saturday! Second Saturday – June 2016 PHOTOS! Leave a comment Second Saturday – June 2016 PHOTOS! Arts and Music Street Fest in Downtown Muscatine! This summer, there will be a new event in downtown Muscatine: Second Saturday, an arts and music street fest to be held on the second Saturday of every month from June-October! The event will take place from 5-8 p.m. on 2nd Street from Cedar Street to Pine Street on each of those Saturdays. Second Saturday … More Arts and Music Street Fest in Downtown Muscatine! Leave a comment Arts and Music Street Fest in Downtown Muscatine! Come Visit Historic Downtown Muscatine! 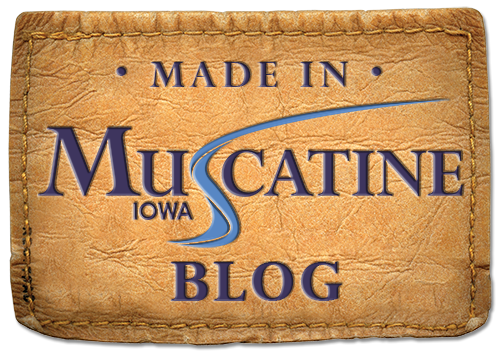 Made in Muscatine is the official blog of the Muscatine Convention and Visitors Bureau in Muscatine, Iowa.